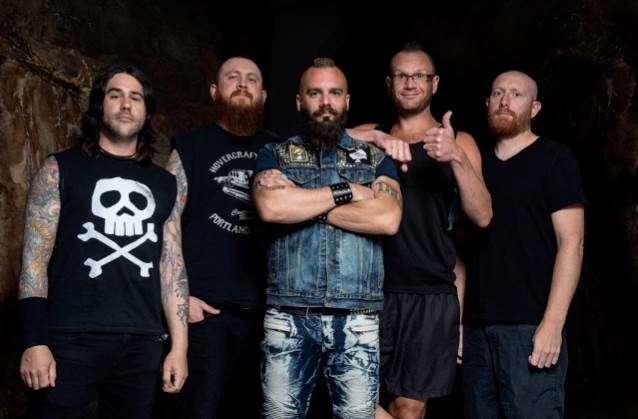 Mulatschag TV conducted an interview with KILLSWITCH ENGAGE members Jesse Leach (vocals) and Adam Dutkiewicz (guitar) at Austria's Nova Rock festival, which was held this past weekend. You can now watch the chat below. A couple of excerpts follow (transcribed by BLABBERMOUTH.NET). Adam: "We got a lot of great offers [from] a lot of great people. But at the end of the day, Metal Blade has been friends for years. It's not even like we looked at them as a record label; we looked at them as guys that we respect and get along with, and we drink with them and hang out with them. So it almost feels more like family — it's like a family vibe instead of all business. It's kind of cool." Jesse: "I feel like they get us — they get us, they get where we wanna go, they have ideas for us, and they have our backs. And like [Adam] said, they feel like friends; it's not just business. It's linking up with people that we enjoy being around that have showed faith. Yeah, it's a great thing." Jesse: "We got him on one song. I wrote a song specifically for him in mind, 'cause him and I hit it off fairly recently. He came out to a show in Canada and I had a chance to talk to him one on one, and we just realized how much we had in common. So I started getting the ball rolling in my head. I thought it would be great for him to come on a song — just to show the fans we're all friends, it's family, it's all good. For all the nonsense that goes on the Internet, we just wanna squash it and let everyone know we're cool. We love Howard, and Howard's new band, LIGHT THE TORCH, is awesome. So it's all good. So he'll be on one song, and we're stoked on that song." Jesse: "[I'm doing] better than ever. I feel like I'm singing better than I ever have. I think that that surgery was a blessing in disguise. I had a lot of damage over the years. Then I went in and did a lot of training with [vocal coach] Melissa Cross, learning how to sing properly and place my voice properly and place my screams properly. It's been a game changer. I'm stoked. I feel good." Jesse: "I worked with her back in, like, 2001, when I first started having issues. But I didn't really take it seriously till I got back with these guys. Her lessons are very interesting, and she evolves as a teacher. I feel like where she's at right now just clicked with me. So I feel like this time around, I'm actually understanding what I'm supposed to be doing properly. It's great. Even my speaking voice — just making sure it's in the right place." Jesse: "I've known that for years. I'd come off stage and spit blood. I just knew every night… I was, like, 'Oh, I don't know. I don't know.' So, I've basically been working on a broken instrument for many, many years. So it's been a long time coming." The group's first release under the Metal Blade deal — and eighth album overall — will arrive in 2019.